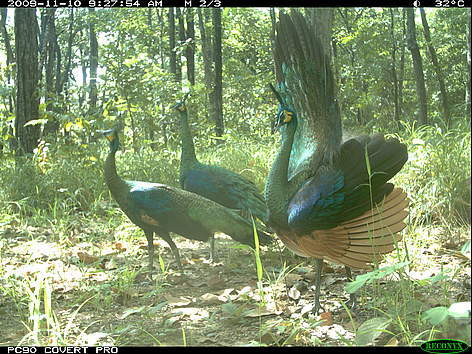 Green peafowl are globally endangered but still regularly photographed by camera traps in Phnom Prich Wilderness Sanctuary within northeastern Cambodia's Eastern Plains Landscape. Green peafowls are probably the most iconic birds of Cambodia – their beauty has turned them into prestigious imperial pets in the world's royal palaces for centuries. Once common throughout the wooded lowlands and lower hills of Southeast Asia, green peafowls have undergone a rapid decline in recent decades. In Indochina just a few populations remain confined to Cambodia’s northern and eastern provinces and adjacent areas of Vietnam. Because of its attractive appearance, the green peafowl still faces the threats of hunting for wild meat, collection for feathers, and the pet trade, and strict conservation measures are needed to ensure their survival.